Much to my amazement I'm really enjoying the rehab three days a week. I look forward to going, instead of having those interminable arguments with myself about getting over to Club One. Not that Club One is bad. The rehab is like have a personal trainer, but one that monitors your heart, not just the way you do your exercises. I think I like all that attention. Also, I work harder. Nothing like being accountable to someone. It's interesting to speculate about why some of those people are there, especially the thin ones. After a lifetime of being told that fat will kill you I see as many skinny people there as fat ones. Did they have heart attacks, or just stents. I'll probably never know, but I have to conclude that being thin is no guarantee of anything. And even though I never returned to the dietitian, I've lost about 5 pounds. 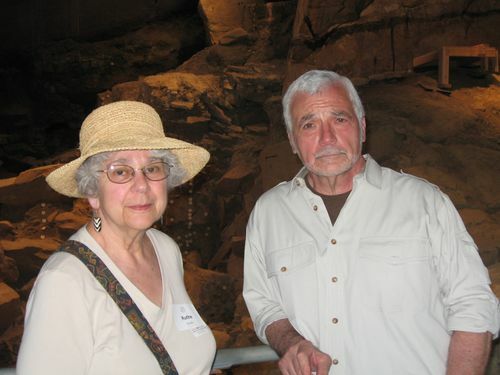 Saturday I went on an Osher trip to Meadowcroft Rockshelter. The rockshelter is a fascinating archaeological dig documenting the oldest inhabited site in the new world. We were fortunate to hear a lecture by Dr. James Adovasio, the original excavator of the site. You can read a little about the controversy he generated at the link above. Here is a picture of me with Dr. Adovasio, taken by Pat, our Osher program assistant. I told her I thought he looked like he was in pain. She replied that he was probably wishing I was 50 years younger. I don't like most of this stuff, probably why it never got fixed and worn. I think I bought it because it fit around the waist and not much did. These were desperation purchases. So how come I seem to be able to buy stuff now? I take it clothing manufacturers have become more realistic and are making things that fit real people. Nice that I've lived long enough to see it.